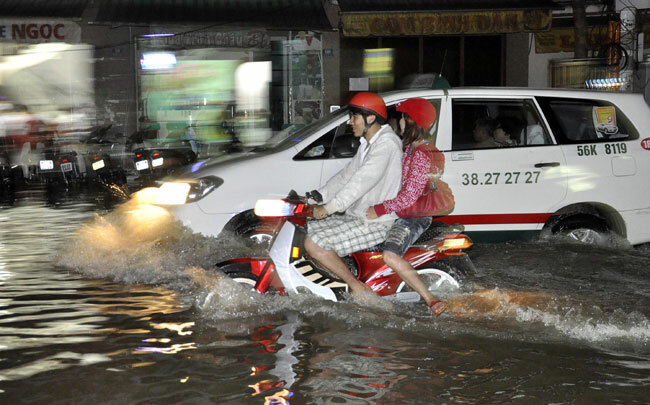 HCM CITY (VNS) — At least 103 irrigation lakes covering a total area of 875 hectares will be dug in and around HCM City to cope with flooding. In 2016, the first three irrigation lakes will be built in Bau Cat in Tan Binh District, Go Dua in Thu Duc District and Khanh Hoi in District 4 at a total cost of VND1.3 trillion (around US$58 million). According to the HCM City Steering Centre for Anti-flooding Programme, the first Bau Cat irrigation lake will be built as a pilot and if it has good results, more lakes will be built. The lake is expected to be 125m long, 32m wide and 2.5m deep, and receive 10,000 cubic metres of rainwater. It will help to reduce flooding on an area of 20 hectares. "If the city People's Committee approves, construction will begin in the second quarter of 2016 and work will be finished after eight months," Nguyen Hoang Anh Dung, deputy director of the centre, was quoted as saying in Tuoi Tre (Youth) newspaper. However, the People's Committee at Tan Binh District, where the Bau Cat lake will be built, said that construction would be delayed because the final work of the urban improvement project to upgrade the Tan Hoa–Lo Gom Canal has just finished. Besides, the Bau Cat area is upstream of the project and is no longer affected by flooding. But the centre authorities confirmed that Bau Cat area needed an irrigation lake to avoid flooding in the future. The Go Dua lake will cover 24ha and be divided into three parts. Two pumping stations will be built there to enhance anti-flooding capability. "Such a lake is needed in Thu Duc District because many places in the area of Go Dua Lake have been hurt by high tides and heavy rainfall," Tran Van Dung, deputy chairman of Thu Duc District, said. For Khanh Hoi lake, 800 households are ready to resettle, but the People's Committee has no money to compensate the families. The Khanh Hoi lake is designed to cover 130,000–192,000 cubic metres. "Irrigation lakes are necessary to cope with flooding, and we can reuse rainwater, but the most important thing is that lakes must be connected as part of a system," Le Thanh Cong, an irrigation expert, said. He suggested that irrigation lakes be built under parks, a stadium and parking lots. Ho Long Phi, director of the National University HCM City's Water Management and Climate Change Centre, said that Bau Cat and Go Dua Lakes would help prevent flooding in outlying areas. He also asked for a change in construction regulations. For example, roads must use concrete that can absorb water and each household must have a tank to keep rainwater.